You may know that you can quickly jump to websites by typing a domain name into a Spotlight search and choosing the ‘Suggested Website’ option, but did you know you can get a live preview of a webpage from Spotlight on the Mac? This is a fairly simple trick that’s pretty useful, and yes it actually fetches a live copy of the webpage in question, rendering it within the Spotlight preview panel using Safari. This was first introduced to OS X some time ago with Lion, but it has carried forward into modern versions of Mac OS X even with the new Spotlight hovering screen. 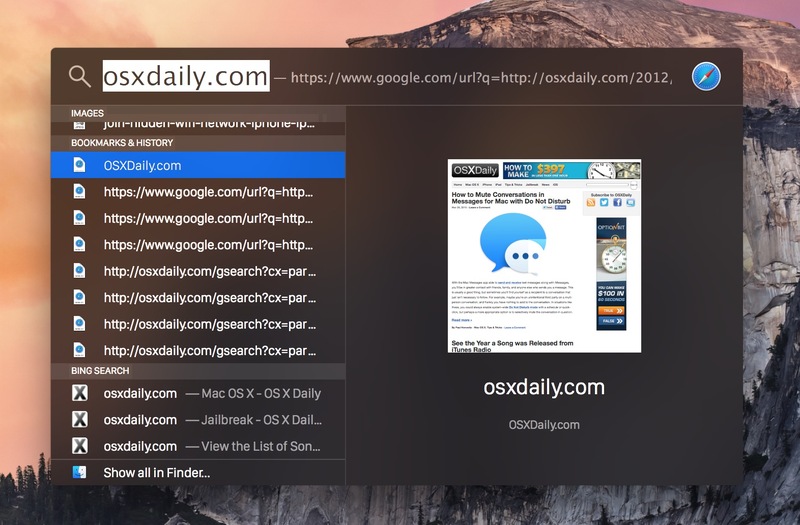 In OS X Mavericks and before, you’ll find the webpage previews render as an enhanced version of Quick Look that allows for live webpage previews directly in the Spotlight menu. Looks nice huh? Spotlight is well featured and is able to preview quite a bit really, including video files and pictures too. Thanks to FB and William Pearson for the original tip..
Alternatively, and vaguely related to that, you can get a view of a live web page by dragging the url on your desktop and opening the .webloc file with Quicklook. Useful if you want to follow a thread on OS X Daily for instance. This feature is part of OS X, it is not region dependent. If you messed with Spotlight settings maybe you disabled it. This didn’t work for me. I have a super-fast connection and waited several minutes: no preview. And I followed the instructions exactly.